It’s no secret that I’m a fan of all things handmade, especially those who are developing small businesses featuring their handmade creations. 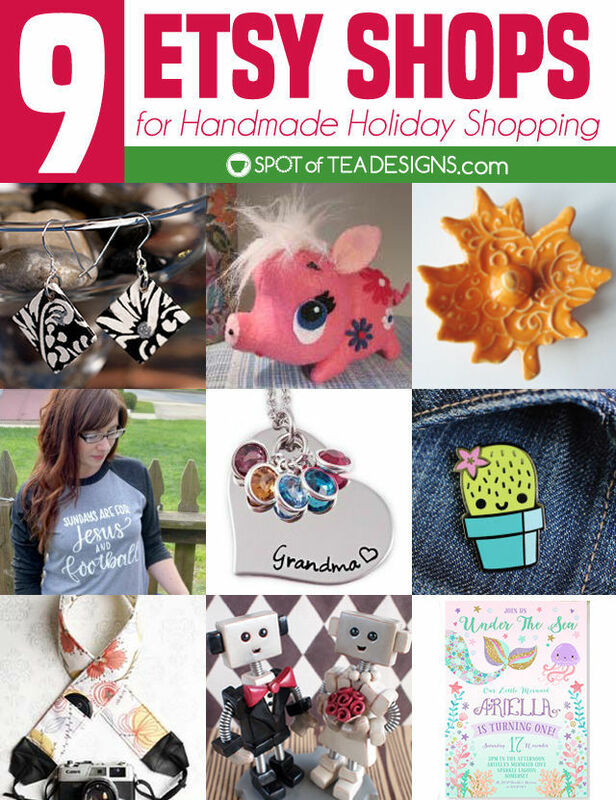 This holiday season I wanted to showcase some Etsy shops which I, a blog contributor, or guest poster have personally shopped at or a newly opened shop ran by one of my crafty friends. Hopefully one of these Etsy shops will line up with someone on your holiday list or someone you may use for future party planning! Happy shopping! Support handmade and small businesses! 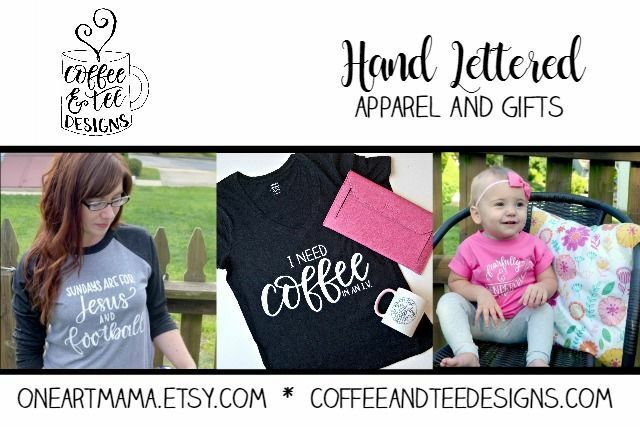 Coffee And Tee Designs by Amy Latta of One Artsy Mama – Looking for the perfect gift? Coffee and Tee Designs offers everything from t-shirts to kitchen towels decorated with original hand lettered designs. Whether you like sweet, inspirational, or sassy sayings, there’s something for everyone. Use the code HOHOHO by 12/20/2016 to get 10% off this holiday season! 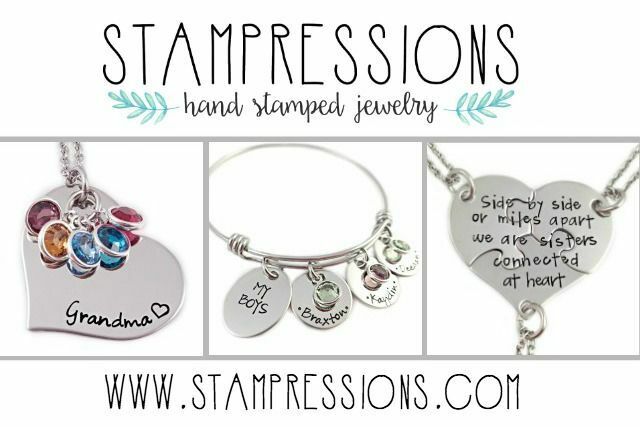 Stampressions – Stampressions jewelry specializes in creating unique, personalized keepsakes for your gift giving needs. Find beautiful hand-stamped pieces for everyone on your holiday list this year. Order by December 5th to ensure Christmas delivery. 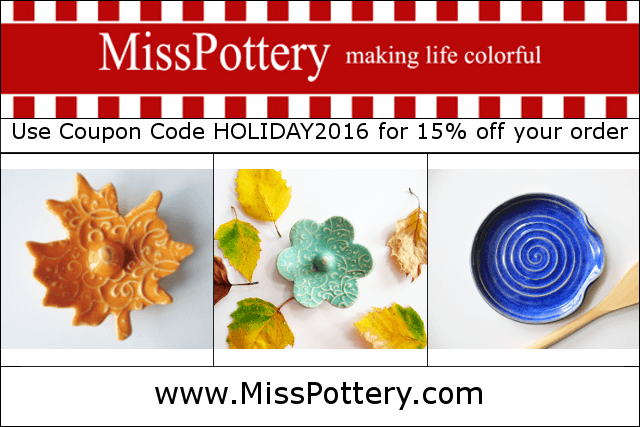 Use the coupon code HOLIDAY2016 by 12/31/2016 for 20% off of your entire order. Note from Tara: I purchased a custom stamped necklace for my sister of my nephews’ names from this shop a few years ago which you can see here! Last year I placed another order for a custom charm to add to the necklace with the arrival of my youngest nephew. 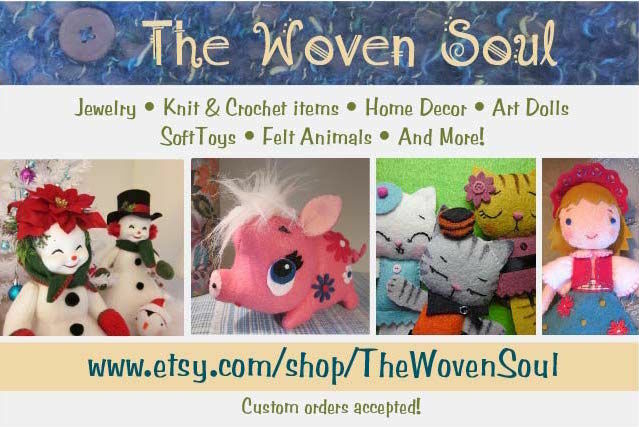 The Woven Soul -Step inside the enchanting world of The Woven Soul. Allow your imagination to run wild, free your soul, & bring joy to your inner child. 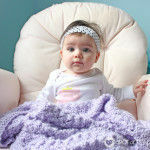 Filled with playful whimsy, warmth & delight, from felt toys to elegant crochet scarves, ornaments, home decor, jewelry & more. You will find the answer to all your gift giving needs. For yourself or someone special…..Enjoy! Note from Tara: Kate, the artist and owner of The Woven Soul, is a past coworker of mine and one who’s illustrated designs I have always adored! She now brings those characters to life with plus toys, among other giftable items, and we were lucky enough to receive this little kitty toy back when Brielle was young. It’s still an active play toy in our collection and has shown no signs of wear and tear, despite being well loved by two toddlers! 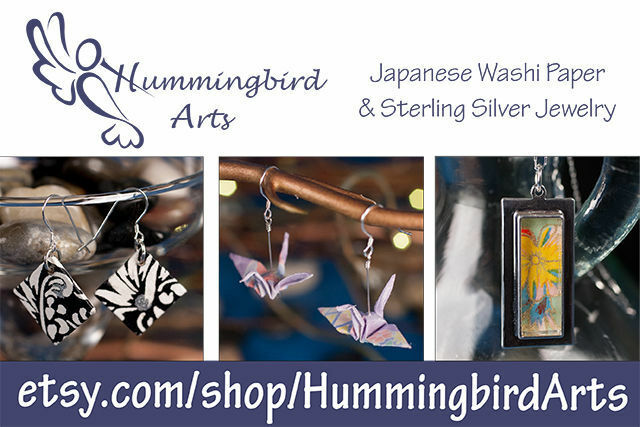 Humming Bird Arts – Hummingbird Arts offers hand folded Origami earrings, bracelets re-envisioned from vintage bangles, and modern pendants all made using Japanese washi paper. Jewelry is nickel-free. Guaranteed to make unique, fun and thoughtful gifts. Note from Tara: Besides this Etsy shop, April is also an art teacher with a brand new studio in Mercer County, NJ! 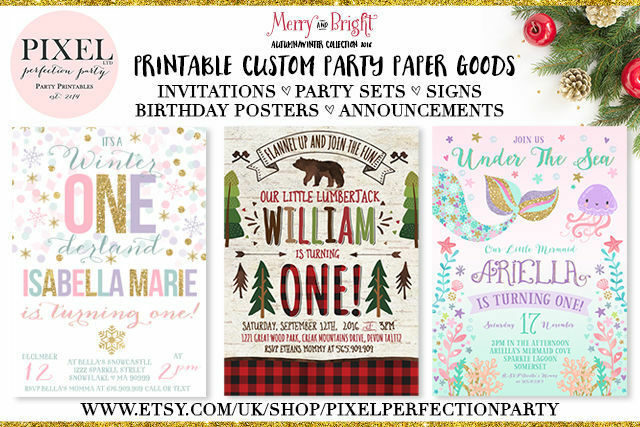 Pixel Perfections Party – Printable party paper goods. Pretty designs for all party occasions. Find us on Instagram (@pixelperfectionparty) for discount codes & freebies. Note from Tara: While I did not personally purchase from this shop, a guest poster previously did, as the invitation design was shared on this Tea for Two themed 2nd birthday party feature. 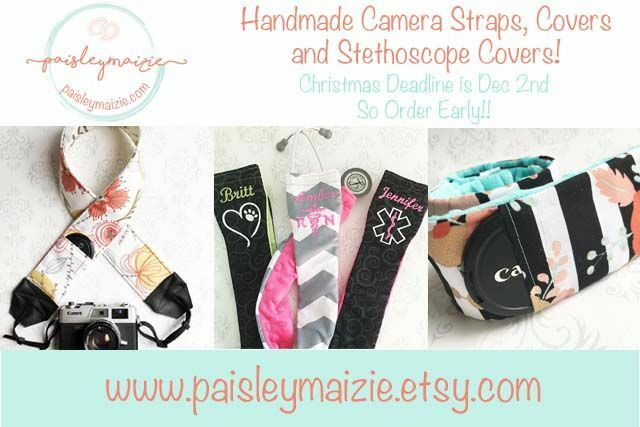 PaisleyMaizie – Paisley Maizie specializes in handmade DSLR Camera Straps, Camera Strap Covers and Stethoscope Covers with optional personalized embroidery! 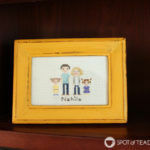 Jamie’s a wife and mom of 3 kids with a small studio in Indiana where she makes each item with care. Shop now! Christmas deadline is December 2nd! Note from Tara: I previously purchased a camera strap slipcover from this shop and have been using it for the past three years! I’m itching for a new one, just to switch up the design, not because I need a new one. Look at all the cute designs she has! Note from Tara: I have purchased several customized ring bowls now for engagement gifts from this shop and have one for my own rings! I LOVE having a proper place to rest my rings (since I don’t wear mine at night) and highly recommend this shop for their quality and cuteness! 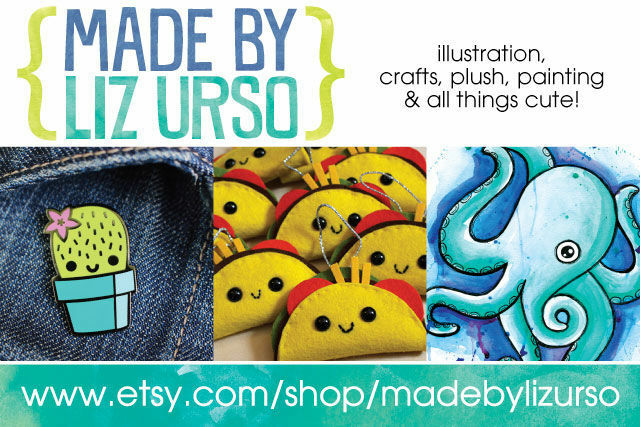 Made by Liz Urso – Being creative is Liz’s source of therapy and hopes her creations make you smile! 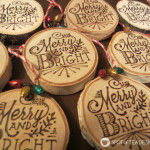 She’s been designing characters and designs for years and finally branched out to Etsy. All designs are original, straight from her brain! Most items are handmade with the exception of the enamel pins so check out her shop for all things cute! Note from Tara: I featured Liz and her handmade creations a few years ago and have been eagerly awaiting this Etsy shop so others can enjoy these adorable creations that I’ve witnessed for the past few years! Robots Are Awesome – Handmade Robot Sculptures: Decorative Geekery. Mixed media creations combining clay and wire by HerArtSheLoves since 2009. 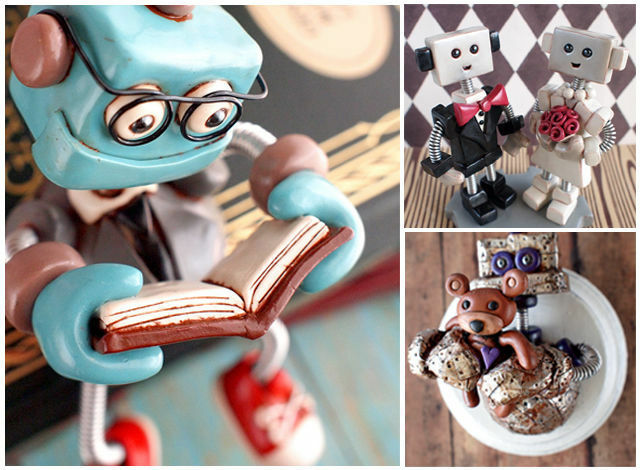 Robot Wedding Cake Toppers, Robot Cupids, Christmas Ornaments, Birthday Cake Toppers, Robot Business Card Holders and more. Note from Tara: SOTD contributor and my bestie Allie ordered one of these robot wedding cake topper for her grey and purple Virginian wedding! 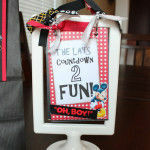 PS my NameBubbles.com giveaway for stocking stuffer sized personalized labels is also still live until 11/17! So cute! I’d love the blue one! The blue one for sure, but all the colors are beautiful. I think I’d choose the leaf ring catcher. Love it.